Performance Enhancing Drugs – In 1894? What’s fun about turning over baseball’s rocks is that it often turns out that beneath them there are…other rocks. “May be, you all do not know that R—- … is a pretty good doctor. Shieber goes on to source what the miracle “Isopathy” elixir was supposed to do (provide accelerated heartbeats and thus an instantaneous surge of strength), what it was supposed to be made of (mashed up ox brains), what it actually was (nitroglycerine), and who apparently used it (Amos Rusie and John Montgomery Ward). A cardiac specialist friend of mine says it must’ve been 100% placebo, or, maybe even pure luck that it didn’t kill either of the 1894 Giants. Patients given nitroglycerine for heart-related chest pain are urged to lie down immediately because blood pressure drops. Still, psychology tells us that placebos often work – and in the 1880’s and 1890’s when “glandular extracts” from animals were supposedly the cutting age of medicine, this might’ve been more true than at other times. Ironically, while Rusie and Ward were very-forward thinking in terms of supplements, they should’ve looked backwards. In 1889, future Hall of Famer Pud Galvin openly enrolled in “medical experiments” in Pittsburgh testing the efficacy of testosterone drawn from monkeys. 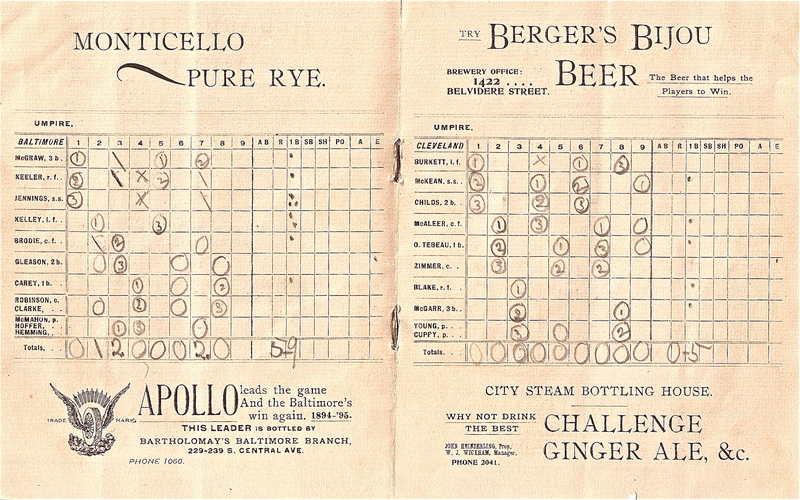 That’s the cover of the scorecard from Game Four of the 1895 Series, supposedly the one owned by Orioles’ right fielder Wee Willie Keeler. One thing you’ll notice right away, that helped doom the Series. Baltimore finished first in the regular seasons of 1894 and 1895, but were upended in the Temple Cup by the second-place Giants in ’94 and the second-place Cleveland Spiders in ’95. 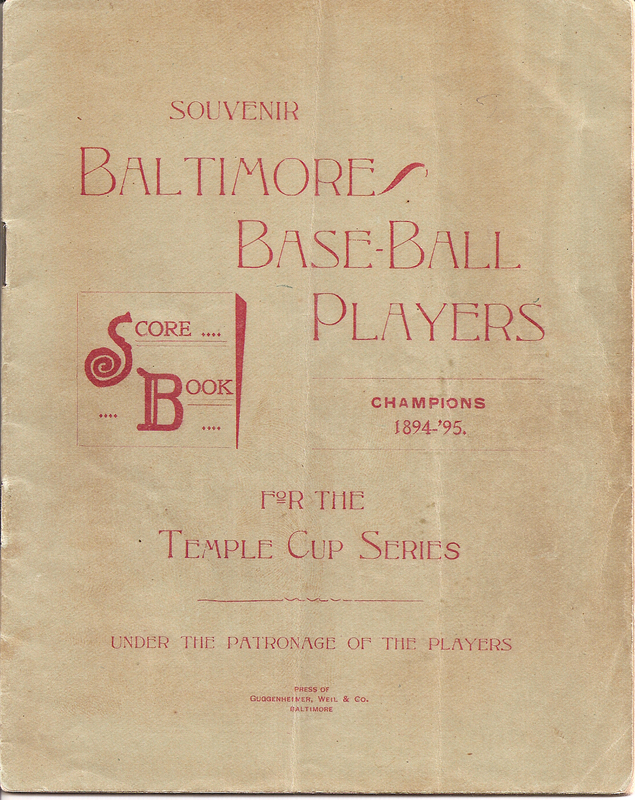 Yet the Orioles, and their fans, still considered themselves the NL champions – and put it on the front cover of the scorecard for the series that was supposed to determine the champions! The hero for Baltimore was their third starter – the equivalent of a fifth starter today – Duke Esper. He threw a no-hitter for four and ended up with a five-hit shutout, winning 5-0 while the faithful Orioles fans pelted the Spiders with projectiles ranging from rocks to eggs. There were no fewer than seven Hall of Famers in this game, including the O’s first four hitters (John McGraw, Keeler, Hughie Jennings, and Joe Kelley, plus catcher Wilbert Robinson, Cleveland left fielder Jesse Burkett, and home plate umpire Tim Keefe). An eighth, Cy Young, had one of his few days off. 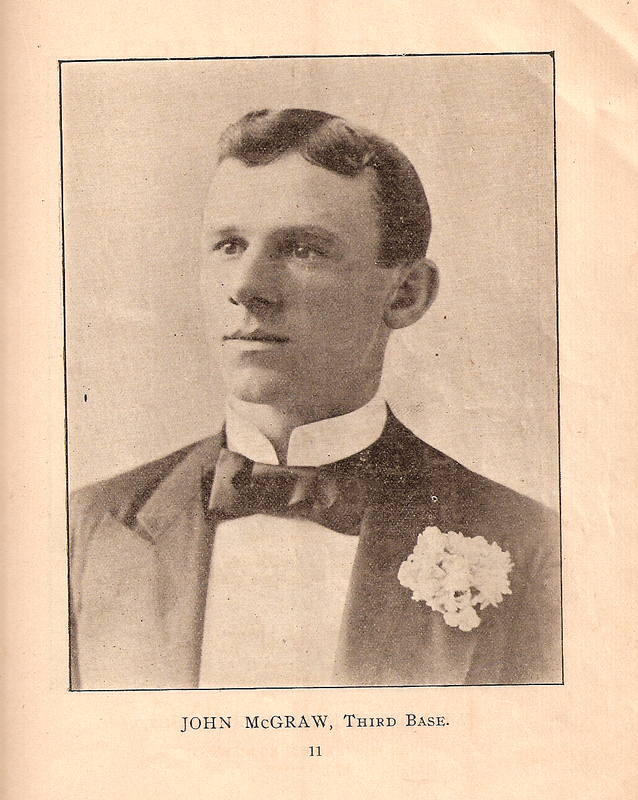 There were five games in the 1895 Temple Cup, and Young pitched and won three of them! Why Am I Whatting The Who Now? I just re-read my entry (below) and I don’t see where anybody might get that impression. But just to be clear, to me “BP” is to the sum total of all forecasting knowledge and its statistical and actuarial bases are impeccable. Years ago, preparing a piece on Tony Gwynn for Sports Illustrated, I discovered by accident that there was a plateau – an exact range of at bats (7,500 to 9,000) at which really terrific .340-.375 lifetime hitters started to plummet back towards the .340-.350 range (Cobb was at .373 through 8,762 AB; Gwynn .340 through 8,187; Keeler .355 through 7,475; Jesse Burkett .350 through 7,273 AB, Lajoie .350 through 8,254. Among them, and Rogers Hornsby, Paul Waner, and Honus Wagner at similar peaks, these eight guys lost an average of eight points from their career averages). So I believe fervently in this decline-and-full stuff and BP (and the Jeter prediction, too). Now if somebody thinks I killed “The First Fall Classic” by Mike Vaccaro… yeah, pretty much (see below).